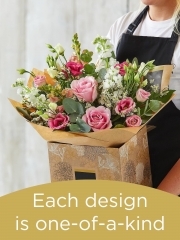 The joyous occasion of a new born baby requires a celebration which is where Aberdeen Flowers step in with our range of beautiful floral bouquets and arrangements. We have over forty years of experience in the floristry industry meaning so no matter what it is you’re after, we are able to fulfil all of your wishes. We receive over four deliveries per week from our Dutch suppliers which means that our flowers are always fresh and, as Dutch flowers are renowned worldwide for being the finest, are of premium quality. Additionally, our suppliers provide the Aberdeen Florists with a vast selection of flowers ranging from roses in all colours to lilies of the Asiatic and Oriental varieties, germinis, gerberas, Alstroemeria, delphiniums and so on. You can browse through the new baby boy flower selection we have online which showcases the latest designs however if there isn’t something online which is fully to your tastes, don’t worry as we offer the bespoke service. 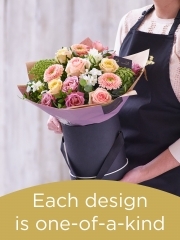 The bespoke service enables you to either tweak elements of something you’ve seen online or you can create a totally unique design which one of our talented Aberdeen Florists will turn into a reality. 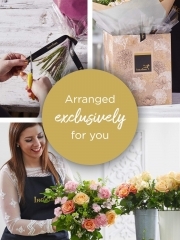 Alternatively, if you’re not entirely sure what you want, you can leave it all up to the florist and we will arrange something perfect for your special occasion. We have both bouquets as well as other floral arrangements on offer, such as vase and basket arrangements. For further information, please do not hesitate to get in touch. You can contact us either by phone or email or you can even pop by our shop. Not only do we have beautiful flowers on offer here at Aberdeen Flowers, but we also have a range of gifts available. Our gift range includes a selection of both wines and champagnes. 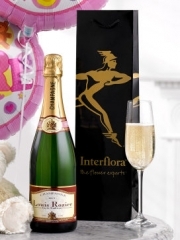 Both drinks are associated with celebratory occasions which is why they are ideal gifts for any happy occasion. We have red, rose and white wine on offer as well as sparkling rose on offer. In addition to wine, we also have champagnes on offer including Louis Rozier and Laurent-Perrier. To accompany the wines and champagnes on offer, we have luxurious boxes of chocolates and truffles available which are a nice treat for a loved one with a sweet tooth. For a more child-orientated gift, we have several teddy bears on offer in different colours including white and brown. As well as all of these gift items, we also have helium balloons on offer. The Aberdeen Florists can arrange balloon bouquets for your special occasion as we stock plain balloons and special occasion balloons. For example, a ‘new baby boy’ balloon bouquet will consist of three plain balloons and three with ‘new baby boy’ written on them. We offer these gift items to make life that little bit easier for you as well as to make your gift that extra bit special. We deliver all over Aberdeen so no matter where you require delivery, Aberdeen Flowers is the place for you. We are also an Interflora member. Interflora is an international network, connecting hundreds of flower shops worldwide. This means that not only do we deliver locally but we can deliver nationwide all over Scotland as well as the rest of the UK and even abroad to 140 countries around the globe.